Explore this collection of articles that demonstrates that conservative chiropractic care is both safe and effective for the relief of radicular pain. There was no significant difference in structural features between SMT responders and non-responders. However, SMT responders demonstrate a trend of a lower prevalence of severely degenerated facets and relatively high baseline ADC values of the L4–5 discs. Interestingly, SMT responders demonstrate post-SMT increases in apparent diffusion coefficient (ADC) values of discs associated with painful segments. These results suggest that SMT responses may be related to some underlying structural responses. Our findings provide a new hypothesis/direction for further investigating the underlying nature of the differential response to SMT, possible mechanisms of SMT and the existence of treatment-specific forms of LBP. The presence or absence of MCs and the category of MC, when present, were not related to the outcomes for LBP patients without lumbar disc herniations who were undergoing chiropractic treatment. This calls into question the clinical relevance of particularly MCs I as a serious pain generator and certainly challenges the theory that MCs are due to infection. These results are consistent with the ones found for lumbar disc herniation patients treated with high-velocity, low-amplitude spinal manipulation. This also supports the hypothesis that chiropractic care is a safe conservative treatment for patients presenting with nonspecific LBP, despite the presence of MCs. Chiropractors expressed the most optimistic belief (median RR 0.56; IQR 0.39–1.03); family physicians expressed a neutral belief (median RR 0.97; IQR 0.64–1.21); and spine surgeons expressed a slightly more pessimistic belief (median RR 1.07; IQR 0.95–1.29). Clinicians with the most optimistic views believed that chiropractic SMT reduces the incidence of acute LDH by about 60% (median RR 0.42; IQR 0.29–0.53). Those with the most pessimistic views believed that chiropractic SMT increases the incidence of acute LDH by about 30% (median RR 1.29; IQR 1.11–1.59). 195 cases of acute LDH with early surgery (within 8 weeks) were identified in a population of more than 100 million person-years. Strong positive associations were found between acute LDH and both chiropractic and PCP visits. The risk for acute LDH with early surgery associated with chiropractic visits was no higher than the risk associated with PCP visits. Both chiropractic and primary medical care were associated with an increased risk for acute LDH requiring ED visit and early surgery. Our analysis suggests that patients with prodromal back pain from a developing disc herniation likely seek healthcare from both chiropractors and PCPs before full clinical expression of acute LDH. We found no evidence of excess risk for acute LDH with early surgery associated with chiropractic compared with primary medical care. Greater inequality and variability of motion sharing was found in patients with CNSLBP than in controls, confirming previous studies and suggesting a biomechanical marker for the disorder at intervertebral level. The relationship between disc degeneration and MSI was augmented in patients, but not in controls during passive motion and similarly for MSV during active motion, suggesting links between in vivo disc mechanics and pain generation. Lumbar disc herniation (LDH) patients mainly restrict the motion of lower lumbar (LLx) and upper lumbar (ULx) in the spinal region during the five ADLs. 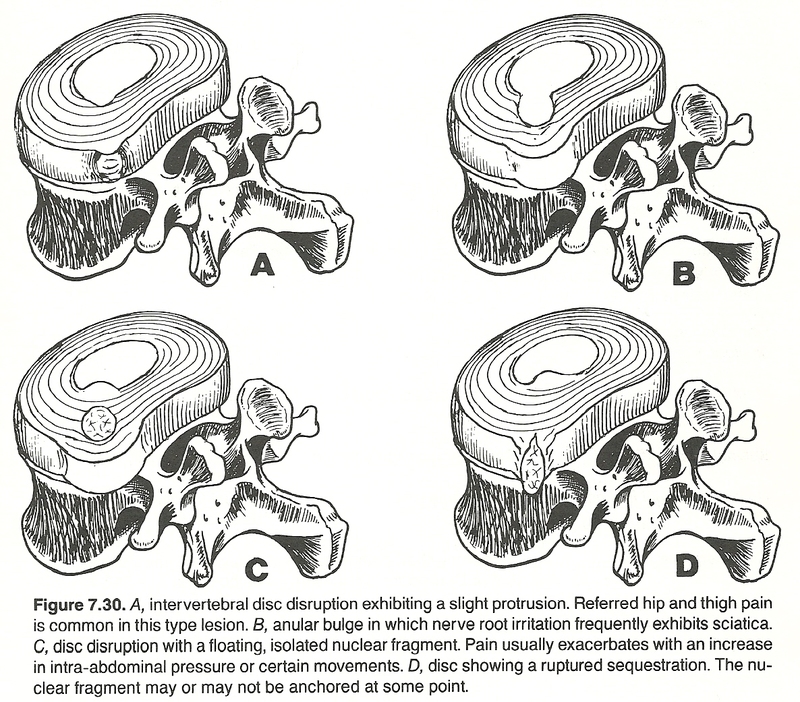 Pelvic rotation is an important method to compensate for the limited lumbar motion. Furthermore, pelvic tilt and lower extremities' flexion increased when ADLs were quite difficult for LDH patients. Via quantitative assessment of physical activity we further find that accelerations at fast walking and slow running (2 m/s), but not high-impact tasks, lower intensity walking or static positions, correlated to positive IVD characteristics. These findings represent the first evidence in humans that exercise can be beneficial for the IVD and provide support for the notion that specific exercise protocols may improve IVD material properties in the spine. We anticipate that our findings will be a starting point to better define exercise protocols and physical activity profiles for IVD anabolism in humans. Spinal manipulative therapy (SMT) creates health benefits for some while for others, no benefit or even adverse events. Understanding these differential responses is important to optimize patient care and safety. Toward this, characterizing how loads created by SMT relate to those created by typical motions is fundamental. Overall, SMT created both significantly greater and smaller loads compared to passive motions, with SMT generating greater anterioposterior peak force (the direction of force application) compared to all passive motions. In some comparisons, SMT did not create significantly different loads in the intact specimen, but did so in specific spinal tissues. Despite methodological differences between studies, SMT forces and loading rates fell below published injury values. Future studies are warranted to understand if loading scenarios unique to SMT confer its differential therapeutic effects. "Improvement" was reported in 86.5% of SMT patients and 49.0% of CNRI patients (P = .0001). Significantly more CNRI patients were in the subacute/chronic category (77%) compared with SMT patients (46%). A significant difference between the proportion of subacute/chronic CNRI patients (37.5%) and SMT patients (78.3%) reporting "improvement" was noted (P = .002). The majority of patients in this study had either extruded or sequestered disc herniations. Patients with sequestered herniations treated with SMT to the level of herniation reported significantly higher levels of leg pain reduction at 1 month and a higher proportion reported improvement at all data collection time points compared to patients with extruded disc herniations but this did not reach statistical significance. Further investigation is needed to determine mechanisms for this finding. This also calls into question the seriousness of disc sequestration in determining appropriate treatment. Three trials with 502 participants were included. Meta-analysis suggested that cervical spine manipulation (mean difference 1.28, 95% confidence interval 0.80 to 1.75; P < 0.00001; heterogeneity: Chi2 = 8.57, P = 0.01, I2 = 77%) improving visual analogue scale for pain showed superior immediate effects compared with cervical computer traction. The overall strength of evidence was judged to be moderate quality. Metabolic Syndrome (MS) components were significantly associated with thoracic intervertebral disc degeneration (DD). Furthermore, accumulation of MS components significantly increased the odds ratio [OR] for thoracic DD. These findings support the need for further studies of the effects of metabolic abnormality on DD. Of the 192 enrolled patients, 191 (99%) provided follow-up data at 12 weeks and 179 (93%) at 52 weeks. For leg pain, SMT plus HEA had a clinically important advantage over home exercise and advice (HEA) (difference, 10 percentage points [95% CI, 2 to 19]; P=0.008) at 12 weeks but not at 52 weeks (difference, 7 percentage points [CI, -2 to 15]; P=0.146). Nearly all secondary outcomes improved more with SMT plus HEA at 12 weeks, but only global improvement, satisfaction, and medication use had sustained improvements at 52 weeks. No serious treatment-related adverse events or deaths occurred. Clinicians routinely encounter patients suffering from both degenerative and acute spinal pain, often as a consequence of pathology affecting the intervertebral disc (IVD). The IVD is a complex structure essential to spinal function and is subject to degenerative disease and injury. However, due to the complexity of spinal pain syndromes it is often difficult to determine the extent of the IVD’s contribution to the genesis of spinal pain. The location of the IVD is within close proximity to vital neural elements and may in the event of pathological change or injury compromise those structures. It is therefore important that clinicians performing manual therapy understand the cellular and molecular biology of the IVD as well as its clinical manifestation of degeneration/injury in order to safely manage and appreciate the role played by the disc in the development of mechanical spinal pain syndromes. Significant improvement for all outcomes at all time points was reported (P < .0001). At 3 months, 90.5% of patients were “improved” with 88.0% “improved” at 1 year. Although acute patients improved faster by 3 months, 81.8% of chronic patients reported “improvement” with 89.2% “improved” at 1 year. There were no adverse events reported. 50 adult Swiss patients with neck pain and dermatomal arm pain; sensory, motor, or reflex changes corresponding to the involved nerve root; and at least 1 positive orthopaedic test for cervical radiculopathy were included. Magnetic resonance imaging-confirmed CDH linked with symptoms was required. At 2 weeks, 55.3% were "improved," 68.9% at 1 month and 85.7% at 3 months. Statistically significant decreases in neck pain, arm pain, and NDI scores were noted at 1 and 3 months compared with baseline scores (P < .0001). Of the subacute/chronic patients, 76.2% were improved at 3 months. The objective of this study was to measure intradiscal pressure (IDP) changes in the lower cervical spine during a manual cervical distraction (MCD) procedure. Incisions were made anteriorly, and pressure transducers were inserted into each nucleus at lower cervical discs. Four skilled doctors of chiropractic (DCs) performed MCD procedure on nine specimens in prone position with contacts at C5 or at C6 vertebrae with the headpiece in different positions. IDP changes, traction forces, and manually applied posterior-to-anterior forces were analyzed using descriptive statistics. IDP decreases were observed during MCD procedure at all lower cervical levels C4–C5, C5–C6, and C6–C7. The mean IDP decreases were as high as 168.7 KPa. Mean traction forces were as high as 119.2 N. Posterior-to-anterior forces applied during manual traction were as high as 82.6 N. Intraclinician reliability for IDP decrease was high for all four DCs. While two DCs had high intraclinician reliability for applied traction force, the other two DCs demonstrated only moderate reliability. IDP decreases were greatest during moving flexion and traction. They were progressevely less pronouced with neutral traction, fixed flexion and traction, and generalized traction. One hundred twenty patients presenting through elective referral by primary care physicians to neurosurgical spine surgeons were consecutively screened for symptoms of unilateral lumbar radiculopathy secondary to LDH at L3–4, L4–5, or L5–S1. Forty consecutive consenting patients who met inclusion criteria (patients must have failed at least 3 months of nonoperative management including treatment with analgesics, lifestyle modification, physiotherapy, massage therapy, and/or acupuncture) were randomized to either surgical microdiskectomy or standardized chiropractic spinal manipulation. Crossover to the alternate treatment was allowed after 3 months. Sixty percent of patients with sciatica who had failed other medical management benefited from spinal manipulation to the same degree as if they underwent surgical intervention. Of 40% left unsatisfied, subsequent surgical intervention confers excellent outcome. Patients with symptomatic LDH failing medical management should consider spinal manipulation followed by surgery if warranted. Lumbar discectomy is one of the most common spine surgical procedures. The average charge for discectomy procedure was $7,841. Although a large number of patients will ultimately require surgical intervention, given that many patients will improve with nonoperative therapy, a trial of conservative management is appropriate. This study reviewed the costs associated with various conservative measures. The present study demonstrated that the changes in sagittal alignment of the cervical spine affect the kinematics. Consequently, it may cause changes in the segment subjected to maximum load for overall motion and accelerate its degeneration. Cases have been reported in which radiculopathy or myelopathy secondary to herniated disk has occurred after cervical manipulation. In each case, it is not possible to determine whether the neurologic symptoms and signs were directly caused by the manipulation or whether they developed as part of the natural history of the disorder. The purpose of this article is to report a case in which a patient with radiculopathy secondary to herniated disk was scheduled to receive manipulation but just before receiving this treatment developed acute myelopathy. There are more studies like this at the Chiropractic Case Reports Page. A total of 64 men and 38 women aged 19-63 years were randomized to manipulations (53) or simulated manipulations (49). Manipulations appeared more effective on the basis of the percentage of pain-free cases (local pain 28 vs. 6%; p<.005; radiating pain 55 vs. 20%; p<.0001), number of days with pain (23.6 vs. 27.4; p<.005), and number of days with moderate or severe pain (13.9 vs. 17.9; p<.05). Patients receiving manipulations had lower mean VAS1 (p<.0001) and VAS2 scores (p<.001). A significant interaction was found between therapeutic arm and time. There were no significant differences in quality of life and psychosocial scores. There were only two treatment failures (manipulation 1; simulated manipulation 1) and no adverse events. The finding of cervical spinal cord encroachment on magnetic resonance imaging, in and of itself, should not necessarily be considered an absolute contraindication to manipulation. However, because radicular and myelopathic complications to cervical manipulation have been reported in the literature, great care should be taken in all cases, particularly those in which anatomic conditions such as cord encroachment are present. A 35-year-old woman presented with complaints of midback pain, low-back pain, buttock pain, saddle anesthesia, and bladder and bowel incontinence, all of 6 months duration. The patient was 6 months post emergency surgery for acute cauda equina syndrome due to lumbar disc herniation. She had been released from neurosurgical care with the current symptoms considered to be residual and nonprogressive. The patient was treated with high-velocity low-amplitude spinal manipulation and ancillary myofascial release. After 4 treatments, the patient reported full resolution of midback, low back, and buttock pain. The patient was seen another 4 times with no improvement in her neurologic symptoms. No adverse effects were noted. Prospective/retrospective studies and review papers were graded according to quality, and results and conclusions were tabulated. From the data published, an estimate of the risk of spinal manipulation causing a clinically worsened disk herniation or cauda equina syndrome (CES) in patients presenting with LDH was calculated. This was compared with estimates of the safety of nonsteroidal anti-inflammatory drugs (NSAIDs) and surgery in the treatment of LDH. An estimate of the risk of spinal manipulation causing a clinically worsened disk herniation or CES in a patient presenting with LDH is calculated from published data to be less than 1 in 3.7 million. Crude cost analysis suggested an overall financial advantage from manipulation. Because osteopathic manipulation produced a 12-month outcome that was equivalent to chemonucleolysis, it can be considered as an option for the treatment of symptomatic lumbar disc herniation, at least in the absence of clear indications for surgery. In this study it was shown that for managing disc herniations, the cost of treatment failures following a medical course of treatment [chymopapain injections] averaged 300 British pounds per patient, while there were no such costs following spinal manipulation. I am often asked by chiropractors, medical doctors and patients if manipulation of the cervical spine is safe in the presence of a cervical herniated nucleus pulposis (CHNP). I usually answer that in most circumstances it not only is safe, but it is often an essential aspect of treatment. I will clarify what this means and provide some of the evidence that supports this notion. I will also illustrate that in most of cases that require treatment, manipulation alone is not a sufficient approach, but that some form of rehabilitation is necessary. The patient was initially treated with ice followed by flexion-distraction therapy. This was used over the course of her first three visits. Once she was in less pain, side posture manipulation was added to her care. Nine treatments were required before she was released from care. The patient was initially treated with high-velocity manual manipulation of the cervical spine and reported a subsequent aggravation of her symptoms. Thereafter, she was treated with short-lever, mechanical-force, manually-assisted chiropractic adjusting procedures to the cervical spine, utilizing an Activator Adjusting Instrument. She tolerated the treatment well and subsequently experienced a complete resolution of the presenting symptoms. Clinically, 80% of the patients studied had a good clinical outcome with postcare visual analog scores under 2 and resolution of abnormal clinical examination findings. Anatomically, after repeat MRI scans, 63% of the patients studied revealed a reduced size or completely resorbed disc herniation. There was a statistically significant association (p < .005) between the clinical and MRI follow-up results. Seventy-eight percent of the patients were able to return to work in their predisability occupations. Conservative treatment including chiropractic manipulative therapy seems to be a reasonable alternative to surgery, for cervical radiculopathy caused by a herniated cervical disc. Clinical trials should be performed to evaluate long term success rate, risk of permanent disability, rate of recovery and cost effectiveness of this and other forms of treatment for cervical radiculopathy caused by herniated nucleus pulposus.findings. The patients were prescribed a treatment regimen consisting of chiropractic management including bracing, physiotherapy, cervical manipulative procedures, traction and exercises. The patients responded well to care as evidence by posttreatment MRI, electrodiagnostic studies, clinical exam findings and thermography scan findings. Patients with and without nerve root compression secondary to cervical disk herniation can and do respond well to chiropractic care. Chiropractic management of this condition can and should be employed prior to more invasive treatment.